Things you should know about the Apple iPhone X is required reading for a world obsessed with mobile phones. When Apple launches its next version of the iPhone, it brings the whole world to a standstill – well at least the tech world and the tens of millions of iPhone fans all across the world. The new iPhone X is here with its full-frontal screen, Super Retina Display, dual-camera, the most powerful chip, and other features it already sounds the next revolution in the world of smart phones. What is Special About the Apple iPhone X? The iPhone X is Apple’s commemoration of the iPhone’s 10th anniversary. According to the company it is the most significant develop in iPhone’s history since the first iPhone itself. And the list of features and technologies it has, certainly make it a big announce. 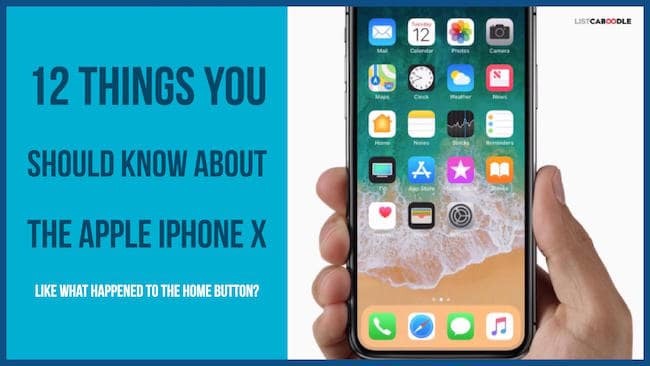 Here are 12 things everyone should know about the Apple iPhone X. The new iPhone X is known as ‘iPhone 10’ where the ‘X’ is a Roman numeral. It is also interesting that Apple has skipped the number 9 in the series and has moved directly from iPhone 8 to iPhone 10. This is the first time the iPhone’s name has used Roman numerals and not the standard digits. However, this is not the first for an Apple device. The Mac OS X is a good example. It is worth asking the Cupertino-based company whether there will be an iPhone 9 somewhere. Apple has launched an iPhone that features an ‘all-glass design’. There is glass on both the front and back, but there is no need to worry about it because according to the company it is made of the most durable glass that has ever been used in any smartphone. But it is not just all-glass, there is stainless steel too. The iPhone X is available limited colors – Silver and Space Gray. It has an edge-to-edge display. You will notice that the phone’s front is literally the entire screen. The only exception comes in the form of a tiny sliver atop the camera. Perhaps Apple didn’t want to waste any space at all. It is only surprising that they didn’t go for a surround-screen. This is also the first time that the iPhone has embraced the slimline concept. Apple has been so diligent with the full-bleed screen that it has eliminated the iPhone’s almost trademark home button. The home button’s functions have been taken over by gestures. You will now have to swipe up from the bottom to access the home screen. Maybe the home button was a hindrance to creating an all-screen-front iPhone. The next time you want to unlock your new iPhone, access certain apps, or verify a purchase, your finger print will not be needed. All you will have to do is to show your face to the phone. The new iPhone X scans and recognizes your face to provide such level of access. Apple has termed its advanced facial recognition technology as ‘Truedepth’ camera system and this is perhaps the biggest new thing about the new iPhone. The company has built a new neural engine in the new A11 Bionic chip that the phone uses (and a neural network in the background). According to Apple, there is only one in a million chance that someone can fool its new unlocking system. What makes the TrueDepth camera system even more interesting? It can recognize you in the dark. It can recognize you even when you have your glasses on. When you grow a beard, it still recognizes you. It makes use of 8 cameras and sensors and even an infrared element. Apple is taking the emojis to the next level. Use the iPhone X’s camera to capture your face and create short clips resembling your emotions and send Animojis to your friends. Choose animals or characters of your choice and have them imitate your own expressions. It never mattered to Apple when its competitors kept offering wireless charging as a novel luxury to the masses. The iPhone maybe a late entrant to the wireless-charging club, but it is still a welcome move. It is based on the Qi wireless charging technology and is also available on the iPhone 8/8 Plus. It is expected that phone users will be able to find Qi-technology based charging platforms in public places in the near future. The new iPhone X has a bright and colorful OLED display that has over 2 million pixels. The 5.8-inch display has a resolution of 1125 x 2436 pixels and a pixel density of 458 ppi, the highest so far for an iPhone. Everything from text to video playback is sharper and more impressive. If you ask Apple, they have named their new flagship phone’s screen, ‘Super Retina’ display. So what do you get in the new iPhone X’s screen? The new iPhone also supports HDR, thus giving a big boost to the mobile HDR video viewing experience. Apple is claiming that the iPhone X has the smartest and the most powerful chip at its heart – the A11 Bionic. It is a 64-bit unit with 6 cores and features Apple’s newly designed GPU and a new ISP. The A11 is 25% faster than the A10 Fusion in the iPhone 7. The custom-designed GPU by Apple enables enhanced autofocusing in low light conditions and pixel processing, which means picture quality is now simply out of this world. When it comes to iPhone cameras, Apple has always focused on retaining the perfect balance. The new iPhone X has a 12MP primary camera that doesn’t seem to be much different from its predecessor’s. But if you look closely you will find that the new iPhone has an entirely redesigned set of dual cameras. The main wide-angle sensor has the same f/1.8 aperture, but there is a new telephoto with a better f/2.4 aperture. Speak about low-light shooting and this combination has you covered. This is also the first iPhone to have optimal image stabilization. Capture true HDR pictures, deeper pixels, less shaky videos, faster autofocus and much more. At a time when almost all the major competitors are taking a plunge into the augmented reality (AR) revolution, Apple didn’t want to stay out of the race. The iPhone X features enhanced support for AR software. The phone’s camera has been calibrated for AR games and its processor supports world tracking. The GPU supports speeds of 60 fps. Apple has enhanced the portrait mode in iPhone X. There is a new portrait lighting feature that allows users to add lighting effects into Portrait Mode shots. You can also capture selfies in this mode using the front camera. This is made possible with the True Depth camera. Apple has certainly launched a new smartphone that sets the benchmark for its competitors to follow. And it has done this without going overboard. While most of its competitors attempt to excel in certain departments and technologies, Apple has always attempted to deliver the perfect balance between features and technologies in the iPhone. With several firsts for an iPhone, the new iPhone X is truly a masterpiece but is it worth the price Apple is offering it at. It is a question only iPhone fans can answer.